Today, 6 June 2014, we commemorate 70 years since D-Day. The Salvation Army has been a source of comfort to soldiers on the front line since November 1894. The Salvation Army’s Naval and Military League was started initially to communicate with Salvationist sailors and soldiers. But the League was soon providing a broader service to the armed forces and had set up a number of Naval and Military Homes in such places as Portsmouth, Malta and Calcutta. During the First World War, The Salvation Army provided motor ambulances, refreshment huts in military camps, and parcels of food and clothing for combatants. Some Officers also served as chaplains. 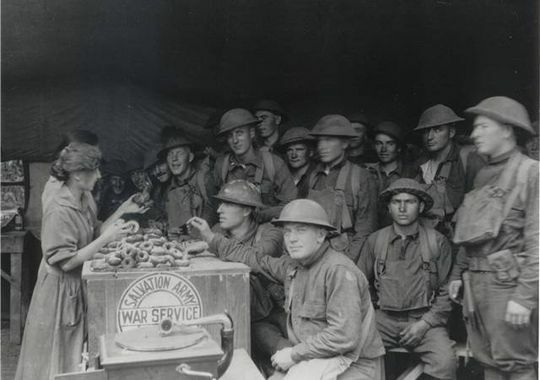 Salvationists were sent to Europe from the USA, including those colloquially known as ‘Doughnut Girls’ who served food (principally doughnuts) to soldiers and often worked in field hospitals. This role was reprised during World War II. Each year on the first Friday in June, North America marks National Doughnut Day to honour these brave Salvationists. The Salvation Army’s Red Shield Services were a familiar and welcome sight during World War II. The distinctive symbol appeared on the mobile canteens that provided not only tea but also chewing gum, soap, toothpaste and sewing kits to military personnel. These canteens arrived in occupied Europe only a matter of days after the D-Day landings and closely followed the advance of Allied troops into Germany. The Salvation Army also provided international hostels and clubs for servicemen, and is present on a number of military bases to this day.